I was lucky enough to be thought of when a dear friend of mine, who runs an antique and curio business, came across this old piece of medical equipment. This set off her NERD meter and she messaged me asking if I was interested! There is very little info on the Internet about the device and definitely no manual! I actually had to read a couple of scientific papers to work out what the unit actually did, and how it works. This was the only source of information on the unit I could find. So how does it work? It is certainly an interesting device. It is battery powered, by a couple of PP9 9V batteries in series, to give an 18V supply. There is a battery check area on the meter, this is activated by turning the range switch to the “B” position, just up from the “OFF” position. The PP9 battery is still available from a few different places, I’ve ordered a pair to see if this thing still works. It will be interesting to see if the unit is capable of detecting background radiation. I hope it does. The probes are also very interesting. They employ a Scintillation Crystal and a Photomultiplier Tube to detect radiation from the patient. It’s a 2 stage process. The 1st stage involves the Scintillation Crystal. This is located at the site where the probe contacts the patient, and detects the radio active particles that are emitted from the patient who has been administered a Radio Isotope. This crystal then emits a pulse of light (Scintillation), usually in the visible spectrum. This pulse of light is then detected by the photomultiplier tube and “multiplied” – resulting in a pulse of current for each radiation particle detected, which is then passed to the instrument itself, where the result is processed and displayed. The Photomultiplier tube is pushed hard up against the Scintillation Crystal via spring pressure. It is encased in an Aluminium tube, most likely for protection. There are 2 probes with this unit, one marked “Probe type 235N”, which has a moveable shroud with what looks to be a ferrite or powdered iron inner ring touching the probe surface, with a long, curly connecting lead, and another marked “Probe 235”, which has a moveable, plain aluminium shroud. I haven’t been able to establish the difference between the two probes. The 18V battery supply is boosted by what looks to be a Cockcroft-Walton voltage multiplier, to a high voltage, most likely variable up to around 3Kv. This is all at very low current, judging by the size of the transformer drive circuit, probably in the uA range. The range switch looks like it selects a number of set voltages. The voltage multiplier board is located in the rear of the unit, seen here. The transformer and drive circuitry are hidden behind the panel with the 3 connectors on it. This high voltage is fed to the photomultiplier tube via the front panel BNC connector and any detected radiation from the probe results in a current pulse that is measured across an anode load resistor by the metering circuit. This pulse looks to then be fed to an integrator circuit, whose role it is to change the pulses received from the probe to a proportional, steady voltage, (i.e. more pulses more voltage) which is then displayed on the meter. I imagine the fast/slow push buttons would relate to the speed of integration. As an example, if the probe detects little or no radiation, (low or no meter deflection) from an area on the patients body and then more radiation (meter deflection increases) when moved to another part of the body, then that increase for that area would be a concern. A practical example of this (now old!) technology was to use this device after injecting the patient with radio isotope Iodine i-133, to detect blood clots in the legs of patients suspected of suffering with deep vein thrombosis. A meter deflection on a particular area of the leg indicated the clot site. My limited knowledge of nuclear medicine hasn’t helped in deciphering the Isotope control. I’ve learnt that differing Isotopes are used for differing areas on the body, for example, the Isotope Xe133 (Xenon Gas) position is used when checking the lung and brain. How this transpires to readings from a probe that only has 2 connections for +ve and Gnd is a mystery. More research showed that other Isotopes on the dial are used for checking other areas like kidneys and heart. I’m sure there’s a perfectly clear explanation out there somewhere. Maybe the different voltages are used with the different isotopes…i.e. 1000V range for Chromium51? Who knows? If anyone can add any insight as to how these units operate I would be forever greatful. The unit is beautifully made. It has a number of quality circuit boards and the wiring is super neat, and has been laced up. it has a number of gold plated edge connectors. It’s all analog, it’s full of IC operational amplifiers operating on a split rail +/- 9V supply. There is a very nice precision 50uA meter movement that would be a bit better quality than your average. The case is a work of art, I have a number of ex scientific instrument cases from England and all are wonderful!!! Should I turn it into an Antenna tuner? We have certainly come a long way from using this type of instrument for medical diagnostics. The clarity and resolution of todays 3D medical imaging machines is mind-boggling!!! On that note I’d like to take this opportunity to wish all BRL blog readers a happy, healthy and prosperous 2019. Well what a year it’s been for our modest little Riverland Radio Club. This year we have seen our Club members engaged in all sorts of cool stuff, WX Balloon chasing, Project HORUS chases, more activity in the Parks’n’Peeks program, project building, and even back into JOTO. There’s been Satellite activity, we’ve run a successful Foundation Course, assisted in the Riverland Paddling Marathon, and of course the staples of the RRC BRL Gathering, BRL Riverland Nets, WIA re-Broadcasts and so on. For such a modest club I think we punch well above our weight, for which I am proud. All this good stuff must come with acknowledgements to all those that call into the nets, join our members on air when out and about in the parks, jump into chase cars, run tracking stations, etc. So thanks to all those both members and non-members who have been a part of this year for us. On the administrative front we’ve almost finalised implementing a new Club Constitution, the website saw a rework, we’ve introduced Berri Betta Home Living – Jaycar as a Club Sponsor (where Regular Members can enjoy a 15% discount), we now have a new structure that includes a number of coordinators, we have ran Foundation course and started new HAMs on their own exciting journey, there is now free Club Membership to new HAMs that undertake a RRC facilitated assessment, just to name a few things. Gotta be happy with that growth! All in all a pretty good year for our Club I reckon, which brings me to a heart felt and special thank-you to our members. I recognise that each member has contributed what they could and I ask for no more that that. Well done all of you. In closing I would like to take this opportunity to wish everyone the happiest possible holiday season, and hope that 2019 brings everyone a very safe and joyful year. More 2019 Gathering details here. Six Meters is a great Amateur Radio band, and there are quite a few active operators, but just about everyone I’ve talked to recently says something along the lines of “ Six Meters sounds great I’d love to be on it”, or “I’d love to get on Six Meters but I don’t have an antenna” It seems it’s seen as more of a “summer only” band in times of slow solar activity. Indeed, ‘ol Sol isn’t going to let you talk to England via the F2 layer with the current number of sunspots. Even without big sunspot numbers, Six meters is a lot of fun via Summer Sporadic “E” layer propagation. VK wide and VK-ZL paths are often a daily occurrence, and VK-Pacific regions, VK-Hawaii, VK-West Coast NA/SA are all a possibility. The fact that just about all modern Transceivers now include Six Meters as standard, and the demise of channel 0 and the accompanying TVI issues that went along with that, ( thanks digital TV!) means that “6” is now more useable than ever. Another plus with 6 metres is that getting a decent antenna up for the band isn’t difficult. For Sporadic E contacts, although a simple vertical or even a dipole will get you on the band, having a bit of gain and direction will often turn what would be a marginal contact on a vertical into a solid contact. This gain and direction is even more important when using weak signal modes like WSPR, FT8 and JT. i have been on 6 metres off and on over the years with various antenna I’ve put together, from verticals to beams. This year I decided to put up something better than the 40M dipole tuned up on 6. I’ve always been aware of the Moxon antenna . I have often contemplated constructing one to use portable for the 20 metre band vertically polarised near salt water. It’s smaller size, small footprint 2 element design seemed ideal to sit on top of one my push-up masts at home. One of the good things about building a Moxon is that at 50 MHz, it’s not a very big antenna at all and, is easily managed by one person. Lightweight construction methods and wire elements will work a treat. Fortunately, there is a good deal of info on the internet about the antenna. There was a very good page called “ The Moxon Antenna Project” , but unfortunately it appears to be down at the moment. There was good information, and many build examples on that page, I hope it gets put back up soon. If working with aluminium tubing is your thing, then DK7ZB has a dedicated section for the Moxon on his website. Step one is to find a Moxon program, either a stand alone downloadable app or one of several online calculators…I went with this one. It really is as simple as putting in the frequency you want to build the antenna for, and letting the program do the work. you’ll be presented with a nice table with all the dimensions. Stick to them to the millimetre if you can, and I”ll bet you’ll be rewarded with a working antenna first pop. Pay special attention to the gap between the two sets of folded elements (measurement “C” in the table above), this dimension is critical to the correct operation of this antenna. Ok, so on paper, we have all the information on the dimensions of the antenna, now we have to translate those lengths into an actual antenna. I found the best place to start was just googling “Moxon Antenna” and looking at a lot of the images and videos available on line. Everything you thought of (or didn’t), will come up and you’ll soon be inspired. Aluminium, wire, wood, steel, nylon, plastic, fiberglass and PVC are just some of the materials people have used in the construction of this antenna. I decided to go with a Nylon chopping board from BigW for the baseplate. This is only going to be in the air for the summer, so longevity isn’t a priority. I used smaller short squidpole tubing from Haverfords as my spreaders. The spreaders had a 150mm length of wooden dowel inserted for strength, and were clamped to the chopping board with conduit clamps from the local plumbing supply house. The right angle bracket is a pergola fixing from Bunnings, drilled to accomodate the U bolts I used to suit my mounting mast. Simple! I mounted a BNC socket through the chopping board and bought out the cable and sealed it with liquid electrical tape. I put a balun at this point also (yeah you should use one). I used an FT140-43 Toroid and wrapped 8 turns through it. I ended up hot gluing the balun assy to the nylon surface, seemed to be quite sturdy. At this stage, I temporarily mounted the antenna after fitting the wire elements. Click on the pictures to enlarge them, you’ll see the pink brickies cord I used as element spacers. the second picture shows the short piece of 16mm PVC water pipe I used to guide the coax to the feed point. I used a two terminal piece of chocolate block electrical connector, hidden inside the far end of the pvc pipe to transition the coax to the elements feed point. I sealed up the ends with bluetack to keep any water or creepy crawlies out. Unfortunately I forgot to get a photo of this arrangement. The wires were stretched out and attached with cable ties slipped over the end of the squid pole spreaders and secured with PVC electrical tape. I used a super strong PVC jacketed, 7 strand copper clad steel, kevlar reinforced antenna wire that I had left over spare from a previous project, but you could use just about anything that can take a bit of tension. 1mm enamelled copper wire for the elements would work well and would be more than strong enough. Just tension everything so that its sits nice and taut across the spreaders. The Moxon calculator must have got it right the first time, as I couldn’t measure any VSWR on my FT-817 at the design frequency of 50.110 Mhz . The antenna seemed to be working, a quick test with some local operators, Adrian VK5AW, Rob VK5TRM, and Mal VK5MJ showed it was both getting out and had directivity. Conveniently, I was able to hear a couple of Six metre beacons from QLD as well. Turning the antenna to test the front to back ratio demonstrated a deep null in the pattern with the antenna driven element 180 degrees to the source, exactly as expected. I decided to mount the antenna above my 8 ele 2/70 Quad, so it is about 13 metres above ground level. I’s rotated with an armstrong rotator, the mast for both antenna is strapped to the palm tree! The antenna seems to be performing well, It’s only been up for around 10 days and I’ve already had several solid SSB and FT8 Sporadic E contacts so far this summer, exactly the reason I built it in the first place. I leave it on the 6M WSPR frequency all day and have spotted stations as far out as 3D2 Fiji and FK1 Vanuatu. So it hears great as well. It’s also small and light enough to pack it in the car and see if you can get some contacts from a park or summit on Six too. So if you’re sick of hearing about Six metres and wish you could get on the band, then this simple antenna should be on your to-do list this weekend! On December 1st the Riverland Radio Club held a Foundation course presented by Rob VK5TRM and Ivan VK5HS. Robert VK5TRM delivered the Foundation course to the 3 eager potential new Amateur operators. 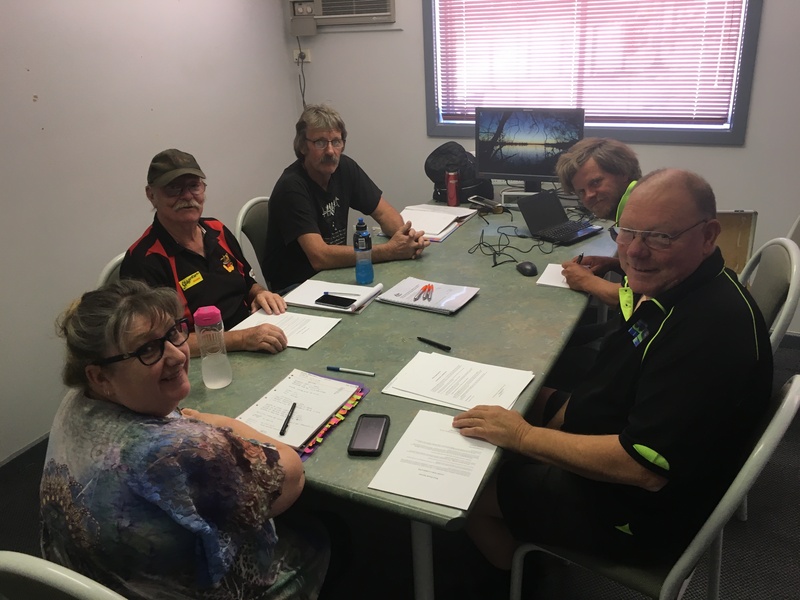 The power point presentation was delivered, as the candidates had all been sent the study material prior the course and had all purchased a copy of the Wireless Institute of Australia ” Entry into Amateur Radio” the course proceeded along in a timely manner. The candidates asked for explanations to clarify anything they had trouble understanding as we progress through the course. The mentoring of the candidates prior the course helps towards running a successful course. Mid afternoon the time came for the serious part of the day, the exam papers were presented to the candidates, Rob explained the process on how the exam was to be conducted. With the clock set for the 30 minute exam the 3 very nervous candidates proceeded to attempt to answer the 25 multi chose questions (I am never sure who is the most nervous, the candidates or the examiners). The time was up pens down Ladies and gentlemen, Ivan collected the papers and proceeded the check and mark them. Rob setup the practical component of the course and commenced the session demonstrating the various requirements of operating a foundation station. Once I had completed the marking of the papers we swapped roles and Rob doubled checked the results. I continued on with the practical session. With the practical session completed we were able to advise the candidates of the outcome of their attempt to join the hobby of amateur radio. We are please to announce all 3 were successful in obtaining a ‘F’ call. Rob and I then started the paper work, with this all filled out we congratulated them on a job well done. Rob and I then announced to the successful 3, the RRC offers free membership for the remainder of the member subscription year to persons undertaking a RRC Facilitated Assessment activity. 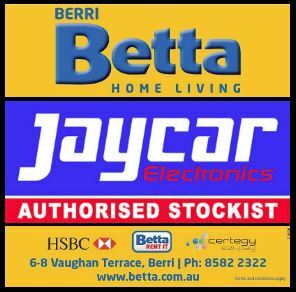 With this membership comes the added advantage of receiving a RRC Membership Card, which when presented at Berri Betta Home Living, a JayCar Authorised Stockist, a discount will apply on non-discounted JayCar product. It is our job as seasoned hams to mentor the new hams to the hobby, it is easy to get new ‘F’ calls. It is much harder to retain their interest long term and assist their journey through our great hobby. RRC would like to thank Peter VK5PE whom provided the venue in Renmark & assisted Rob & myself. RRC would like to introduce Sandy, David and Stephen to our great hobby. Please listen out and welcome them when they get on air with their new call signs. With huge thanks to the team of Berri Betta Home Living our local JAYCAR Authorised Stockist, we can announce a new incentive program for Riverland Radio Club Regular Members. Regular Members can enjoy a 15% discount on JAYCAR lines, excluding already discounted items. Head to the “Membership” page and find out more about our membership.